How to install Syncfusion ASP.NET MVC6 or UWP NuGet packages ? 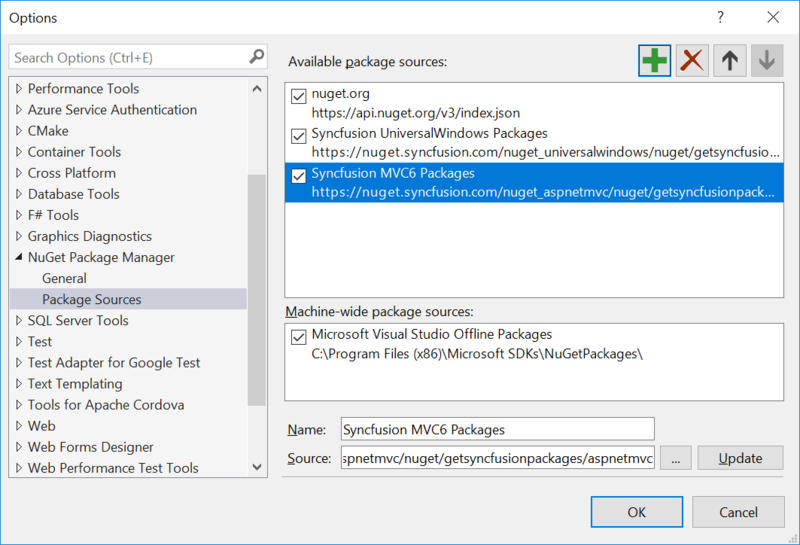 You may face the NuGet Package installation error while installing the Syncfusion ASP.NET MVC6/UWP platform NuGet packages from Syncfusion public feed URL. There is some URL redirecting issue with NuGet Package Manager in Visual Studio 2015. As a temporary work around we have suggest to use the Syncfusion full feed URL (after all redirects) instead of Syncfusion public feed URL. Follow the below steps to install the Syncfusion ASP.NET MVC6/UWP platform NuGet packages without any issues. From Visual Studio 2015 Select Tools-> NuGet Package Manager-> Package Manager Settings, and the Options dialog will opens. Navigate to the NuGet Package Manager->Package Sources from the Options dialog. Click the Add button to create the new Package Source. Select the newly created Package Source and rename the source name using the Name input box. Copy the below modified required platform of Syncfusion ASP.NET MVC6/ UWP full feed URL’s and paste it in source input box. Note: If you have already added a package source for Syncfusion ASP.NET MVC6/UWP packages kindly update the Source URL as like above mentioned full feed URL’s. Now right click on project->Manage NuGet Packages, NuGet package manager will be opened. Then Install the desired NuGet as per your need.